A truly surreal piece of exploitation which is so insane you can’t help but admire it. This is another grave robbing exercise in creating a seemingly new ‘Bruce Lee‘ film, much in the same vein as its non-related predecessor. But this is a lot more fun than Robert Clouse’s garbled Game of Death. 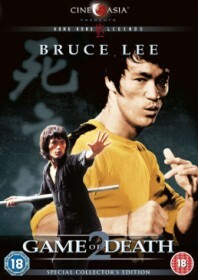 ‘Bruce Lee’ paradoxically returns as Billy Lo, eager to discover the reason behind his master’s sudden death which (sure enough) leads to his own death. This is clearly the moment where Golden Harvest ran out of unseen Bruce Lee footage, so Billy falls from the undercarriage of a moving helicopter. Cue a reprise of genuine Bruce Lee tributes and in walks Billy’s brother, Bobby (Kim Tai-chong, credited with the rather fitting name ‘Tong Lung’) who continues with Billy’s investigations. Given the circumstances, Kim Tai-chong does very well at steering the second half of this cavalcade. Highlights include a visit to the underground sci-fi laboratory of crazy fighter Roy Horan, a battle with a man in a Tarzan outfit, a fight with a random monk (Lee Hoi-san) and a big battle with Hwang Jang-lee. It is complete madness, but this shameful exercise is also fabulously entertaining.